But first things first, “You gotta stay fresh.” Marcus says his high school is “a big fashion show.” Everyone is dressed well so it’s a challenge to keep up. His tips are to “find your own style” and think about “how you want people to see you.” What you see is what you get! As for academics, Marcus’s favorite subject right now is chemistry. He finds it interesting and he benefits from his strength in math. This could prove useful as he considers studying engineering in college. 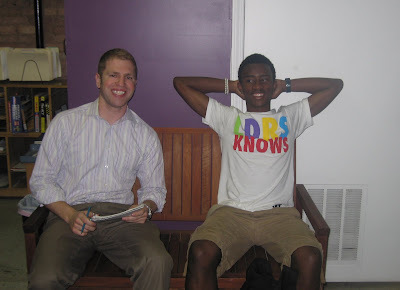 Marcus’s tip for mentors is to get to know your student and become friends with him or her. “Let them know that you care and that you’re there for them if they need you,” he says. This will build trust and understanding and lead to a better mentor-mentee relationship. This summer Marcus plans to continue working (he has a paper route) and having fun. He loves to stay active. He plays pick up basketball and he runs track for school. His motto is: “Just live by the day.” Have a great summer, Marcus, and thanks for making Cabrini Connections an important part of your life!